Someone offered me $300. Don't know if this is reasonable or not. life would be insane to follow Ebay prices honestly Bridgestones are very nice but I don't see any of their models fetching that kind of money. Offer bumped up to $350. Many say the Sun Tour Superbe Pro group alone is worth $300 & rising. Maybe list it on EBay for minimum bid of $500? I wrote the software for these Discussion Areas over 10 years ago. At the time I thought that having a place where you don’t need to register or login, but could just post a question or post an answer, was the way to go. But when it comes to posting pictures and maintaining continuity in a conversation I see this model lacking. Here at OldRoads our stats are at the highest they’ve ever been. So maybe this is the time to buy some forum software and have forum contributors have their own logins. On other forums I visit, I like to be able to search for replies to my posts and to upload photos easily. What are your thoughts or recommendations? Your a great guy and I love old roads and have been with you from the start. I like it the way it is simple. I don't see the need for the change. If I need a picture or someone wants one it is easy enough to send. Thank you for your feedback here and via email. We've purchased more server space and software for a new forum and are in the process of setting it up. The rest of our site will not be changed � we�re just upgrading the Discussion Areas. The hard part will be trying to put the 200,000+ messages from the old forum into the new forum, if that is even possible. There will be a "Guest" mode which works as this forum does today � you can be totally anonymous � you can post messages, etc without logging in. But you can also register and use your own account, easily find old conversations, maintain a profile, etc. And there will be full picture hosting. No need to have an account on photobucket or snapfish or anywhere else. Need help finding a value on a 1987 Trek Elance 400 with a Reynolds 531 frame, serial number 292630. Bike has been in storage since new and is in excellent condition. Probably only has 10 miles on it. Still has the "tire hairs" on the tires. Was going to ride it, but it is in just too good of condition and thought I might sell it. Anyone have an idea of it's value. I would appreciate it. Thanks. Find similar bikes on ebay. It's a bit new to be "collectible," but it's a good quality bike and if it's like new should be worth at least a couple hundred. Why not keep and ride it? If its so nice just ride it why bother trying to sell it. I just picked up one at a garage sale that looks totaly original, trying to find anyone that knows anything about them. Must be branded for the American market, department store perhaps. Post some pictures, but I expect it's a low-end bike-boom ten speed. Sachs/SRAM Rival name seems to be used for components over several years. Users and reviewers seem to like the components. Since you have two similar bikes with different brand groups, why don't you compare them and report? The Bottechia with the Sachs is gonna be a parts bike sadly the top tube has a nasty dent but every part is in working condition. 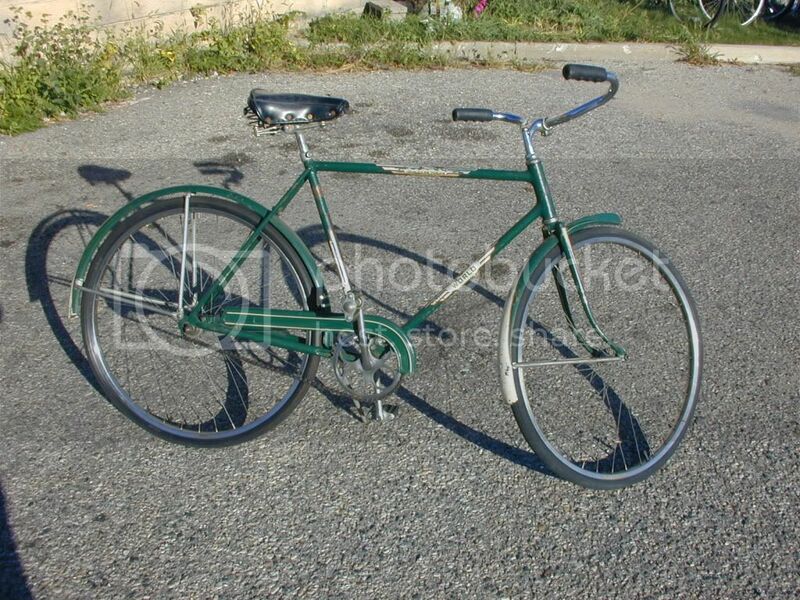 The other Bottechia I own is too small for me to ride but is in mint condition. I was just curious to what a fair price is for a full Sach Rival groupo in used condition. I purchased a made in japan Schwinn Traveler III that I'm guessing is from the late 70s for 15 bucks last weekend and it has a kink in one of the wheels. I have had a mid 70s Ross Super Gran Tour for a few years which has the same sized rims. I'm wondering whether or not I should put the Ross' rims on the Schwinn, or if I'd be better off leaving them on the Ross. I only ask because the schwinn has a really nice look and feel to it and I'm thinking about making it my main ride around bike. Thanks to anyone who has advice! I'd go ahead and make the swap. I had a Ross SGT from the days when they were still making the frames in Pennsylvania, and it was nice components-mostly Shimano 600 Arabesque- on a heavy frame. When I got a better frame I parted out the Ross. This past weekend we had a bicycle come into our possession. I am having a heck of a time finding any information on it. It appears to be a vintage racing/road bike. I wanted to see if you could tell me anything about it. I would appreciate any info you can provide me with. It is a pink or coral colored Omega Deluxe 12 Speed women's bicycle. It has Shimano accessories. The frame has a label "4130 CR-MO tubing frame", the serial numbers on the bottom of the bike are A8707000008 81075. Let me know if you can help or if you refer me to someone who might be able to please. Thanks much!. It was definitely not a racing bike, ladies racing bikes were always versions of a men's frame with a top tube for strength and lightness. I have a bike exactly like yours I think,it has 27 X 1 1/4 wheels with a quick release hub on the front and an aluminum seat post. The handlebars look to be from a mountain bike though.I don't know anything about it either,sorry, I was just looking and came across this post. Cleaned and ready for EBAY. I sold a very similar old Varsity a few years ago on ebay. I think I got only 2 or 3 bids. The name's association with the later electro-forged frames might have hurt my prospects. Good luck. Details since my previous post. This is an Iver Johnson nickle plate(? ), Stamped 348047 and at the rear where the axle joins the frame is a small raised 63. The shallow metal rim is about 1" wide outside and inside about 7/8". The diameter is about 25-3/4". Where do I buy tires and what size size tires are needed. latest bike acquisition: Schwinn tall frame 12 speed Chicago star badge one of the last dying gasps of Chicago Schwinn Schwinn chromalloy 1240 tubing the bicycle is lightweight but still I doubt the tubing is anything to get excited about. the rims thrill me they are Belgium made Weinmann's with the eyelets the rims are alloy and are pinched style with a tall sidewall. will be fun to ride them! needs tires, tubes, a chain,rim strips, new cables, a sensible shifter a good cleaning and "rust resolution" in a few spots. please don't leave a bicycle outside. the hubs are Maillard, the derailer cluster is a thin 6 speed piece of junk the bike is white with schwinn script on the fork and seat tube but nothing on the down tube and it is prophetic with the word Schwinn looking like it got slashed with a razor blade. Looks aweful! i'll use the alloy bluemels on it and fit a rear rack, I'll put the upright handlebars on it and commit bicycle heresy and I'll enjoy ever moment of it. It's a step up from the Peugeot A more faster bike. the brakes are nothing special, the double crank is S.R. and it's a Schwinn Letour. One of the last to hear the chicago badge. All the bearings need regrease. it's a mix of Shimano, Maillard and who knows who did the headset! the fork has the Rudge sloping fork design. $30.00 but it'll need a few things to get it ready for the runway the rims are gonna be a treat! yet the frame is common and if the seller wanted more than 30.00 I would have said no. The paramounts and superiors are wortha bit more. please explain how this is a step up from a Peugeot. Some LeTour models are nice but don't forgot about the Jap built Scwhinns, the prelude and the tempo were very nice bikes also. the tubing in lighter in the schwinn it is Chromolly and the Peugeot has plain "gas pipe" Love them all, the Schwinn is a 26 inch frame and fits well a joy to drive! I don't "play with" the Jap built Schwinns The Paramounts and Supuriors yes, this Le tour with the Chicago badge is a good bike. 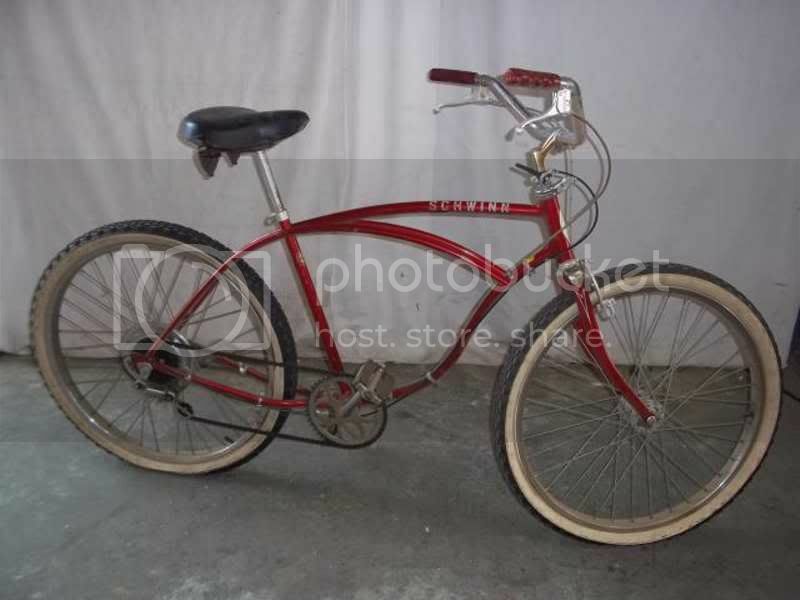 I like to find a Schwinn Paramount at a yard sale for $45.00 next to the Huffy. Gentlemen, when you abbreviate the word _Japanese_ you sound disrespectful and angry. Language, please. Chris I agree that if you take a Peugeot at random you're as likely to get gaspipe as if you take a Schwinn at random. But be on the lookout for the good Japanese-made Schwinns, Volare, Voyageur, Super le Tour 12.2. The real deal. The metal wheel rims are very shallow. Where do I buy tires for these wheels? THANKS FOR THE RESPONSE! forks not bent at all. everything is straight including the rims. has a bit of patina on the rear rack, but other than that even the paint is good. actually not rusty at all. I thought the fenders were aluminum because they were shiny but a bit dull like aluminum, but magnet sticks to them... although they LOOK like aluminum.